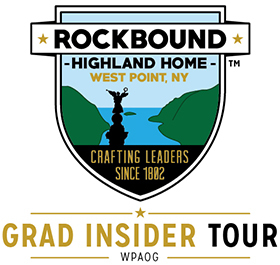 The exclusive Rockbound Highland Home Grad Insider Tour includes a series of tour stops not available to the public and allows graduates to share unique experiences of West Point with their families and guests. Depending on the chosen tour time, you could have the opportunity to visit: the Cadet Mess in Washington Hall, Jefferson Library, Thayer Award Room, Army Sports Hall of Fame in Kenna Hall/Kimsey Center, Arvin Cadet Physical Development Center (ACPDC), or the Cadet Uniform Factory. Please login to see the link for the Rockbound Highland Home Reservation site. You must be a graduate to access the site. Grad Insider Tours will be conducted twice a day Monday through Friday at 10 a.m. and 2 p.m. and must be reserved at least three days in advance. Schedule of home football Fridays varies. Please allow two to two-and-a-half hours for the tour. Please also be prepared to walk approximately two miles and maneuver stairs. WPAOG will provide transportation for the Grad Insider Tour, which will begin and conclude at Herbert Hall (698 Mills Road). Vehicle size and exclusive arrangements with USMA restrict tour size to 10 participants. A fee of $25 per graduate and $10 per guest will be collected when reserving your spot on a Grad Insider Tour. Please Note: At least one graduate ticket must be purchased for your group. A graduate MUST be present in your group on your tour. Tours are for graduates' leisure purposes only. For information on how to support the Rockbound Highland Home Program and other WPAOG initiatives, click here.